This isn't new, but I don't think the story got posted at DU. Rail cars are strewn about Friday in a sparsely populated area about 18 miles west of Cheyenne, Wyo., after a freight train crashed into the back of another freight train the night before. The crashed killed at least one crew member with another missing and derailing more than 50 train cars. A Union Pacific worker died Thursday evening in a train crash west of Cheyenne. A second worker remained missing Friday. The crash happened at 7:45 p.m. when an eastbound train hit a second, stopped train 18 miles west of Wyoming's capital city, according to the Cheyenne Mayor's Office. Union Pacific spokeswoman Raquel Espinoza said Friday that local emergency response agencies and Union Pacific workers were still looking for the missing person. She declined to offer details about the missing person. ... "It is a very sad day for Union Pacific," she said. The spokeswoman said the wreck occurred when a moving train hit the rear of a stopped train, both of which were eastbound. Espinoza said an investigation would determine why the train had stopped, among other things. UPDATE 10/9: The body of a railroad employee listed as missing after last week’s derailment in Laramie County has been recovered. 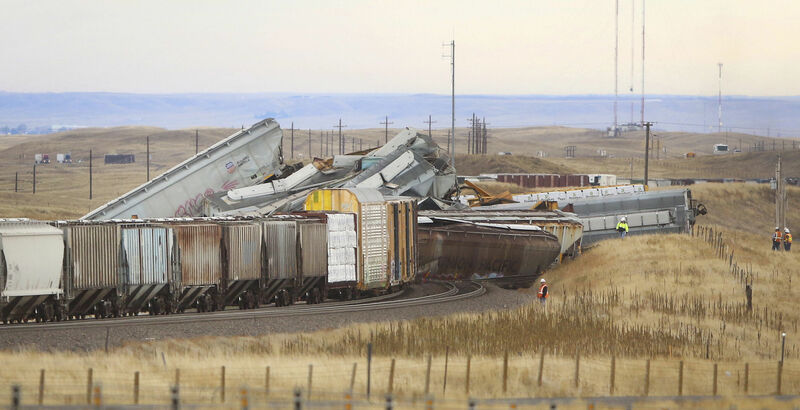 According to the Associated Press, a “catastrophic” train derailment has occurred in Laramie County.